Preheat oven to 375 degrees. Line 10x15" baking sheet with parchment or foil. In a large bowl stir together cookie crumbs, sugar and butter until combined. Evenly press into bottom and sides of lined baking sheet. Bake, rotating half way through, 10 mins. Transfer to a wire rack to cool ~20mins. Sprinkle cooled crust evenly with nuts and chocolate. Pour condensed milk over the top, spreading to cover completely (do not let it drip over edge to avoid sticking). Sprinkle with coconut. 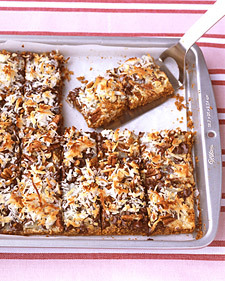 Bake until coconut is toasted, 10-15 mins. Transfer to rack, cool completely. Cut evenly into pieces.